We’ve previously mentioned evergreen content before but it is something that is always important. Evergreen content doesn’t just cover landing pages, it covers more in-depth pages that will always be relevant and that you always want to drive traffic to. 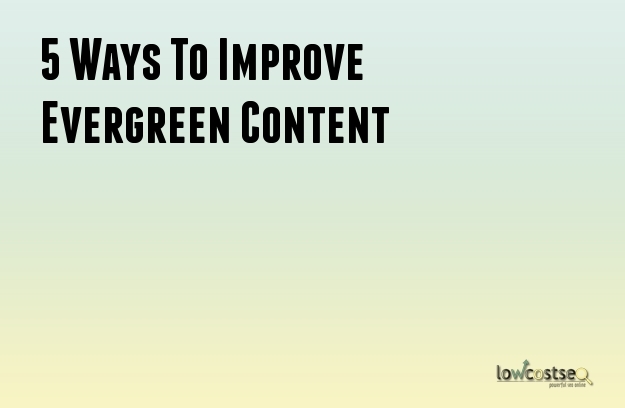 So, let’s look at 5 ways to help improve your evergreen pages. If you had to choose between “Top 10 fashion designs in 2017” and “Top 10 fashion designs in 2016” - which is more relevant? Furthermore, how different will the content be? In some cases, not much. Furthermore, if you have both pages on your site, they are both competing for “Top 10 fashion designs”, which will spread your linking power more thinly and make less use of your crawling budget. Instead, why not have one page that is regularly updated? The keyword and year method is well known to SEO agencies and, in the right situations, it works. Your articles about 2016 and 2015, etc, will spike throughout the relevant year but will likely decline over time. Updating the year – and in some niches, the month – makes more sense. As another example, a restaurant that has a standard menu page doesn’t have the same impact as a restaurant with a page that promotes the “new menu for April 2017”. It’s also widely known that people like list-based post. While it’s often good to simply add to lists, you can run the risk of having content that’s too large. The “100 best SEO tools” isn’t useful to readers if they’re just looking for 1 or 2, for example. However, the “Top 10 Best SEO tools” is more impactful. 10 is a very appealing number – it offers depth, but doesn’t overwhelm with choice. Sometimes you need to forgo the Skyscraper method. Similarly, why not add an adjective or two where possible? Don’t just offer the “Top 10 summer recipes”… offer the “top 10 easiest summer recipes” or the cheapest, quickest, healthiest etc. The point is, if you use these qualifiers to give your content some more impact, it can spark extra relevance when competing on SERPs. Likewise, an emotional factor is always helpful. Some of the best lists out there use this brilliantly. Content that offers something to reduce a user’s stress, make them laugh or ease their day often do well with traffic. It hints that your content will actually do something and – if you follow through on your promise – this can lead to successful content. Sometimes, trends and attitudes change. If your content falls behind the times, you have two options: create new content, or update the old one. If you’re putting effort into creating long term success, then you should choose the former option. Make sure your pages continue to rank well for the right keywords. If they don’t, see what content is beating you on the search engine results. Are they offering better advice, or have they established better links? Be sure to adapt and update your own page. In some occasions, you might also find that search queries change, especially in niches which are prone to fashion or seasonal changes. If your content is tied to something that is out of fashion, you might want to adapt it. What Makes Great Evergreen Content? So, with these things in mind, how can you create great evergreen content? In short, focus on things that are always relevant and offer content that gives the reader a final, ultimate answer. This is why how-to pages are always useful. Readers will always need to know how to change a tyre and such a title would give a reader everything they need to know. Lists, likewise, should also have a goal. “Top 10 photos of cute puppies” is not quite the same as “Top 10 photos of puppies that will make your day”. Case studies, tutorials and other articles can all be evergreen, if you get them right.